wine-pages’ Address Files contain information for the wine- and food-loving visitor to some of the world’s great wine regions. The address files are compiled from notes made by Tom Cannavan, and by visitors to the wine-pages web site. Here is the resource guide for Hungary and Budapest, mostly taken from posts to wine-pages’ UK Wine Forum. Simon Goldberg: I visited Budapest for the Queen’s Jubilee long weekend at the beginning of June 2002. At the time the exchange rate was 359 Hungarian Forints for £1. I loved my visit to Budapest, and intend to return. One word of warning: Hungarians seem to regard it as rude if you walk up to them and aske Do you speak English ?”. You are supposed to say “Good Morning”, or something similar, first. Phil Shorten: Without a doubt, Tokaj is one of the most beautiful and historic wine regions I have had the pleasure to visit. It is fascinating to witness the revival of a region that has contributed some of the world’s most distinctive and complex wines. One thing I did learn is that Tokaji Aszu wines are not just a good accompaniment to foie gras, blue cheeses and desserts. They also marry very well indeed with pork, rabbit, hare, turkey and feathered game (duck, goose, pheasant, etc.) that are served with slightly sweet sauces or with fruits. The sweetness balances salt present in the meats, the botrytis character matches the fruity sauce or fruits and the acidity cuts through both fat and rich sauces. It is therefore not surprising that Tokaj is located nearby one of the major areas producing goose liver, and that the local cuisine often uses stone fruits such as cherries and apricots together with game meats. Simon Goldberg: As regards Budapest wine shops, my friends had advised me to try Preshaz Borkereskedes Bp at 1052 Vaci Utca 10 (Tel 266-1100). Vaci Utca is the main pedestrian road in Pest, full of tourists. The wine shop (“Bor” is ‘wine’ in Hungarian) is below ground level in an alley. They can speak English. However, I did not like their attitude, and bought nothing there. Maybe they were having an off-day. Or maybe I was. 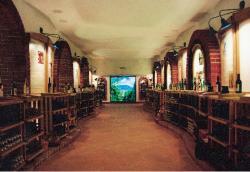 A good place place to taste is The House of Hungarian Wines. H-1014 Budapest, Szentharomsag ter 6. It’s in Buda, near the castle, and the fee includes a rather inappropriate souvenir glass. You walk around the cellar helping yourself to any bottle that is open. Unfortunately, there was nothing great when I visited, though my antipathy may be due to the fact that it was full of drunken Australians!I bought most of my wine at Bortarsasag, which the Lonely Planet strongly recommends. It is also known as the Budapest Wine Society Shop, and is at Batthyany utca 59 (Tel 212-0262), south east of Moszkva ter. Open 10am – 8pm weekdays, and to 6pm Sats – free tastings on Sat afternoon. This shop was friendlier, and better informed than the others. I bought half a dozen wines from them, mostly on their recommendation. I also bought a couple of bottles of Tokaji at the Klausal ter branch of Kaiser’s supermarket, for example a 6 puttonyos Tokaji for HUF 5,499. VAT on wine is 25%. You can reclaim this at the airport, provided that you have spent sufficient (I think about about HUF 30,000) on one single slip. Do not miss the Nagycsarnok (Great Market Hall) for paprika, saffron, beautiful embroidery (upstairs), and traditional Hungarian snack foods. Phil Shorten: An introduction to Hungarian wines in Budapest at the House of Hungarian Wines (see above) does not give one a particularly great impression of the quality of the nation’s vinous stocks. The concept is a good one; for roughly £10, you are given a tasting glass and invited to wander through an underground cellar complex and taste your way through Hungary’s 20+ wine regions. Fifty bottles are open for one to try. Thankfully, spittoons are provided, as negotiating one’s way back up the steps to the reception would be no mean task. Unfortunately, many of the wines offered for tasting are either poorly made or presented in poor condition. Many of the white wines resembled dry sherry and the reds were too often herbaceous with green tannins. Thankfully, the wines one comes across in Budapest’s cafes and restaurants are a good deal better. Indeed, Kekoporto makes a very pleasant rosé for summer drinking, and quite a good food wine as well. However, the real reason for visiting Hungary was the 200km drive to Tokaj, home of one of the world’s most historic wines, Tokaji Aszu. Disznoko is owned by the French insurance giant AXA, who also own the likes of Châteaux Pichon-Baron and Suduiraut. A modern winery and cellar door was completed and was first used for production in the 1995 vintage. 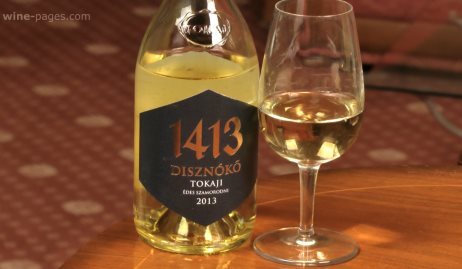 Disznoko produces primarily Aszu wines and is one of the wineries responsible for developing a new style of Tokaji Aszu. There is no doubt this is a serious operation, from their high profile swank front-of-house on Hwy 37 near the turn-off to Tokaj, through the very modern winery and underground cellar. Royal Tokaji Wine Company was the first private winery established during the post-Communism reforms. Formed in 1989, with the backing of Danish investors and the collaboration of Hugh Johnson and 63 local producers, headed by Istvan Szepsy (now arguably the region’s leading producer). In 1993, the winery was sold to a group of British investors. The Royal Tokaji Wine Company has done an extremely good job of marketing Tokaji internationally and has developed export markets in Europe, Japan, the US and Canada, but it is not open to the public for visits. Istvan Szepsy is without a doubt the leading light of Tokaj. He was a key figure in the formation of the Royal Tokaji Wine Company but has been producing his own wines since 1987. He produces late harvest and Tokaji Aszu 6 Puttonyos wines under the Szepsy label. He is also behind Kiralyudvar (“King’s court”, the winery was formerly the King’s cellar) and Zemplen. Istvan Szepsy has a strong commitment to quality and continuous improvement, reflected in his commitment to low yields and experimentation. It’s hard to imagine a more ideal setting on a hot summer’s day than being in a cellar 10 feet underground enjoying fantastic wines. Oremus is a substantial investment by Spain’s Vega Sicilia and one of the largest producers in the region. The new state of the art winery is fully equipped with modern technology, showing that Oremus is a very serious operation indeed. If I had to describe the wines of Oremus in one word, it would be good. However, while being good, the wines are not particularly exciting. This excitement may well emerge with bottle age, but to me, the wines come over as being technically clean and well made, but lacking character and individuality.